Notes: The mining of coal in the Rainton and Pittington areas in County Durham was developed by the 3rd Marquess of Londonderry and his wife, Lady Frances Anne Vane-Tempest, who bought the coastal Milbanke estate at Seaham in 1821. For more than 200 years wagonways had been constructed in south-east Northumberland and north-east County Durham to carry coal from pits to waterways for export. The Londonderry family built a network of wagonways, notably one from Rainton, about five miles north-east of Durham City, and another from Haswell Colliery, both leading to the harbour at Seaham. The Marquess had negotiated for his coal to be exported via Sunderland on the River Wear, but in September 1828 he decided to develop the harbour at Seaham into a coal port. The North Dock at Seaham opened on 25 July 1831 followed by the South Dock on 29 July 1835. However, as production at the Londonderry collieries continued to grow it was necessary to divert some coal to Sunderland, at first from Seaton on the Durham & Sunderland Railway (D&S) which had opened for mineral traffic in July 1836. The Londonderry family eventually constructed its own Seaham & Sunderland Railway to convey coal to the mouth of the River Wear, and it ran parallel to the D&S for a little over a mile northwards from Ryhope Grange Junction; southwards from here the line continued to a terminus close to Seaham harbour. 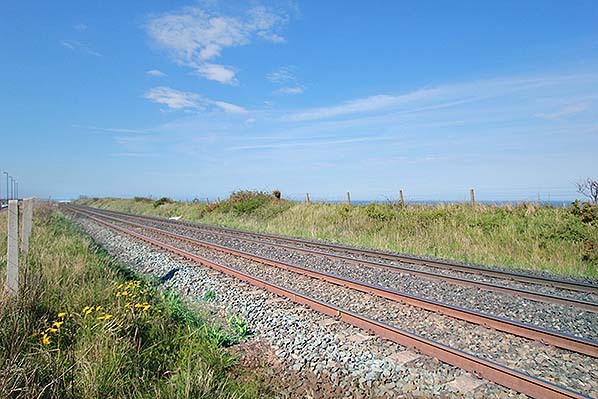 The first sod of what was officially named the Londonderry (Seaham & Sunderland) Railway, was cut on 8 February 1853 and the line opened for mineral traffic on 3 August 1854. A passenger service began on 1 July 1855 operating between Seaham and Sunderland (Hendon Burn station) which was about half a mile south of the D&S Sunderland (Moor, or Town Moor) terminus; since July 1854 the D&S had become part of the newly formed North Eastern Railway. Although the Londonderry Railway was not constructed under an Act of Parliament it had been inspected by Col. Yolland of the Board of Trade whose report, dated 2 May 1855, noted that the line was 5 miles 1¾ch in length and that only stretches of the route between Seaham and Ryhope and at Seaham Harbour were double track; the intention was to double the whole line. Yolland referred to a completed platform at each of four stations: Seaham Harbour (10ch from the line’s southern end); Seaham Colliery (20ch); Ryhope (2 miles 40ch) and ‘Sunderland Dock’ (5 miles 1¾ch). On 1 May 1858 Sunderland (Moor) terminus closed and Sunderland (Hendon) replaced it about half a mile south. This station, instead of Hendon Burn, was also used by Londonderry Railway trains from 1 October 1868. On 4 August 1879 the line, still in use today, opened through the centre of Sunderland with a new Central station and the Hendon terminus closed. There is considerable doubt as to whether the Londonderry Railway opened a station at Ryhope with the line on 1 July 1855, despite reference to it in Col. Yolland’s inspection report, mentioned above. The Ordnance Survey 1: 10,560 map surveyed in 1856 and the 1: 2,500 published in 1875 refer to Ryhope station (singular) at NZ414529 immediately north of the point where the NER (ex D&S) and Londonderry lines converge to run alongside each other towards Ryhope Grange Junction. Quick (2009) argues that the NER’s station, which opened with the line on 19 October 1836, will have remained open thereafter, although it was not listed in Bradshaw timetables until June 1858; early timetables, notably in north-east England, sometimes omitted stations which are known to have been open (as between Newcastle and North Shields). However, Bradshaw of January 1858 states that the Londonderry Railway’s 12.55 from Seaham ‘meets the D&S trains at Ryhope’ and Quick suggests that the timing would not have allowed anything beyond a change of platforms at this point, implying that both railway companies had adjacent stations at NZ414529. It is possible, however, that some form of conveyance was provided between the NER and LR stations if the LR had opened what was to become Ryhope East. This note was absent from Bradshaw of January 1859, by which time it is well established that the Londonderry station at NZ414527, about 11ch south of the (NER) site shown on the 1856 / 1875 maps, was in operation. There is additional uncertainty about a first station as distances stated in the Col. Yolland inspection report place the LR Ryhope station 2 miles 20ch north of Seaham Colliery station; if it was a true interchange adjacent to the first NER station it would be closer to 2 miles 25ch. Ryhope East was 2 miles 14ch north of Seaham Colliery, the distance based on the NER line diagram. The building at Ryhope (LR) station, opened in 1858, was designed by Brewer, the Marquess of Londonderry’s Estate Clerk of Works. It was a charming and most unusual structure on the down (Sunderland-bound) platform with some mildly Gothic features. Because the railway was elevated, the lower of the two storeys was built against the embankment with only the upper storey at platform level. Uncoursed stone was used in its construction. Openings were an assortment of rectangular and pointed-arch shapes. The lower storey was recessed behind broad arches, and the upper storey was topped with a slate pitched roof carried forward over the platform to provide shelter and supported by four pillars linked by thick, arched brackets. Attractive bargeboards were provided with a wavy profile, pierced by quatrefoils, and there were pointed finials at the apex. On the up platform the timber waiting room block was similar to NER pent-roofed designs but with a central circular-arched entrance. The two facing platforms were 192yd in length connected at the northern end by a footbridge which, being of Londonderry Railway origin, was unlike designs found at NER stations. In the timetable for 1863, below, the Sunderland terminus was the Londonderry Railway’s own at Hendon Burn, close to the NER’s Hendon terminus to which the Londonderry transferred its trains on 1 October 1868 allowing Hendon Burn to close. A further change took place on 4 August 1879 when the present Sunderland (Central) station opened with the north-south through line. The August 1887 timetable, below, shows a much more frequent service on the Londonderry Railway. In the late nineteenth century coal mining was migrating eastwards in County Durham as deeper measures were exploited, some of the new collieries being close to the coast and even extracting coal from below the sea bed. In 1893, a proposal for a direct coastal railway between West Hartlepool, Seaham and Sunderland was made by various business interests, but both the 6th Marquess and the NER opposed it. The NER itself obtained an Act in 1895 for such a railway, and at the same time the company gained running powers over the Londonderry Railway with a view to using it for the first 3½ miles of the line which would continue to Hart, where it would meet the existing NER line (from Ferryhill, and from Sunderland via Ryhope and Wellfield) to the Hartlepools. By the North Eastern Railway Act of 30 July 1900 the NER purchased the Londonderry Railway with a view to using this as part of the new route. There were certain exclusions from the NER’s purchase such as Londonderry mineral wagons and guard’s vans, the wagon works and the private station serving Seaham Hall. The NER took possession of the Londonderry route on 6 October 1900. In 1899, its last full year of operation, the Londonderry Railway carried 532,366 passengers, the vast majority (89%) 3rd Class. Seaham booked 131,789 and Seaham Colliery 41,847, but by 1911 the fortunes of these two stations were reversed. The new coastal line between Sunderland, Ryhope, Horden and the Hartlepools opened on 1 April 1905 from just south of Seaham Colliery station. It became the principal route between Sunderland, West Hartlepool and Middlesbrough, and the line remains in use today. It is likely that the Londonderry station at Ryhope was renamed Ryhope East at the time that the NER acquired it to distinguish it from the NER’s existing Ryhope station. Certainly it carried that name on 3 December 1903 when NER records show that the stationmaster, Mr J O Watson, left his post at Ryhope East to take on this role at Shincliffe. On the same date Ryhope’s stationmaster, Mr R Lumley, left his post, and Mr Thomas Lish was transferred from Leadgate station to Ryhope to take charge of Ryhope East as well. 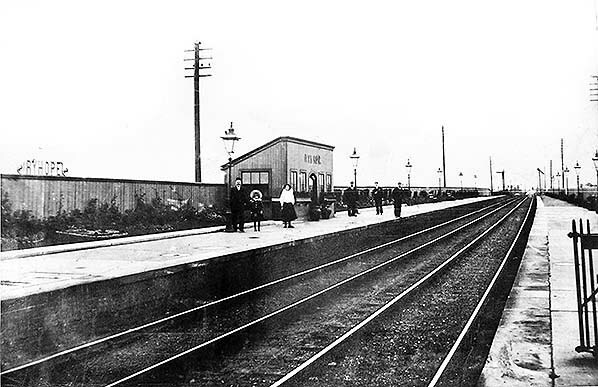 From this time the two Ryhope stations were administratively treated as one; thus in 1911 NER statistics are combined to show a local population of 11,236 booking 138,568 passengers. In 1913 the stations’ goods yard (at this time named Ryhope) handled 1,476 tons of scrap iron and steel and 27 vans of livestock. In January 1923 the North Eastern Railway lines became part of the new London & North Eastern Railway (LNER) at the ‘Grouping’. Stationmaster Lish was still in post at this time, supervising Ryhope and Ryhope East stations, but he retired on 20 February 1925. No record has been found of the date of appointment of Richard Wilkinson who was stationmaster until 31 December 1931, but it is possible that it was he who replaced Mr Lish. No details of stationmasters of the Ryhope stations have been found until the death in service of Mr H R Peacock in 1951; his date of appointment is not known. In 1924 the LNER addressed the anomaly of the little-used private Seaham Hall station (sometimes referred to as Hall Dene) between Ryhope East and Seaham Colliery which had been provided for the use of the Marquesses of Londonderry, their family and guests. They had the right to stop trains ‘other than express trains at Seaham Hall, within reasonable limits’. The Londonderry family had moved to Wynyard Hall resulting in negligible use of Seaham Hall station; it seems that on only four occasions since the NER’s acquisition of the line in 1900 had trains actually stopped here. The LNER sought to extinguish permission to stop trains, and the family’s agent agreed to this on condition that Seaham Colliery station was renamed Seaham and that Seaham was renamed Seaham Harbour . The renaming of these stations and closure of Seaham Hall took place on 1 March 1925. The 1920s and ’30s saw increased competition offered by road motor transport, notably buses in this area where car ownership was probably not high. In May 1931, for example, Northern operated a quarter-hourly weekday bus service between Sunderland and West Hartlepool (half-hourly on Sunday) and Sunderland District Omnibus Co provided hourly services every day. Northern also ran a half-hourly service between Sunderland, Ryhope, Murton, Haswell and Thornley – all with stations on the old Sunderland – West Hartlepool railway. Intending passengers enjoyed generous provision of public transport at this time. Rather than capitulate to the buses the LNER increased the frequency of trains which called at Ryhope East, some services continuing to use the former Londonderry Railway terminus to start or end their journeys, although it was a through station. In reality the notion of capitulation to buses is misleading as the Railway (Road Transport) Act of 1928 was promoted by the four big ‘grouping’ railway companies to allow them to operate buses; and under a subsequent agreement made with existing bus interests, railway companies were permitted to acquire up to 50% of the shares in bus companies. The LNER took advantage of this and acquired a financial stake, for instance, in Northern and in Sunderland and District (who provided ‘competing’ buses – see above) as well as United. The winter 1937 timetable, below, shows a respectable train service, albeit neither as frequent nor regular as buses. The hourly-interval Sunday train service to and from Seaham Harbour seems lavish, but economies were made by using one-class-only ‘Sentinel’ steam railcars on these runs as well as on some weekday operations. The NER and LNER made no significant improvements to Ryhope East station. Gas lighting remained in use. The LNER did, however, install its standard running-in nameboards with metal letters pegged onto a wooden board. On 11 September 1939 the Seaham Harbour terminus was closed at the outbreak of World War 2, never to reopen. The station’s attractive timber building was not demolished until August 1971. In common with many stations elsewhere in Britain, Ryhope East saw a marked reduction in its departures. In June 1943, in the up direction there were 10 Monday-to-Friday calls, 12 on Saturday and two on Sunday; down train departures numbered 10 on Monday-to-Friday, 12 on Saturday and two on Sunday. The pre-war frequency was not restored after the end of hostilities. On 1 January 1948 most of the railway network in Great Britain was nationalised as British Railways (BR) and the Ryhope stations were allocated to the North Eastern Region (NE). Mr H R Peacock is thought to have been stationmaster at this time. After his death in service on 23 June 1951 it is likely that he was succeeded by Mr H J Millett who held the post until December 1955 when he was transferred to Longwood & Milnsbridge. By this date Ryhope station had closed to passengers, but Ryhope (goods) and Ryhope East passenger stations remained in use. Mr G W Barker was appointed stationmaster at Ryhope at an unknown date and was in post until May 1960 when he took charge of Beal station. The timetable shown above was destined to be the last for Ryhope East. The service is sparse and at irregular intervals. The absence of evening trains is conspicuous and had been a characteristic of the station’s service since 1950. The Sunday train service had effectively ended prior to 1953 when only the single early morning down train continued to call, for passengers to alight, presumably allowing the economy of closing the booking office on Sundays. 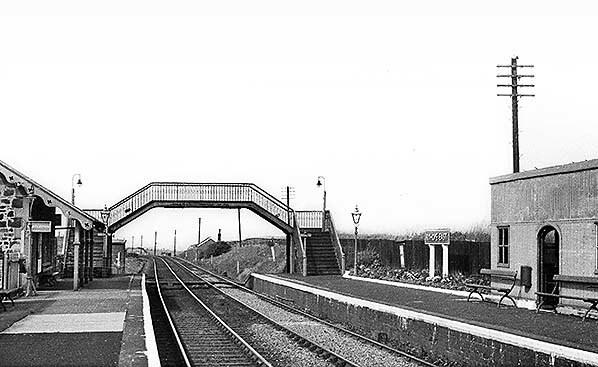 Ryhope East station closed to passengers on 7 March 1960. On that date Ryhope Goods was renamed Ryhope East, but this facility survived only until 1 June 1964. The station had been demolished by autumn 1972 and nothing of it survives. A new road, Sea View (here without a view of the sea because of the railway embankment) passes the station site. The railway remains in use. In this undated view Ryhope East, the Londonderry Railway’s station of 1858, is seen from the north-west. The building is unique in design, its architect being Brewer, Clerk of Works to the Marquess of Londonderry’s Estate. The lower storey is built against the embankment with only the upper storey at platform level. Uncoursed stone is used in its construction. Openings are an assortment of rectangular and pointed-arch shapes. The lower storey is recessed behind broad arches, and the upper storey has a slate pitched roof carried forward over the platform to provide shelter. The bargeboards are given a wavy profile, pierced by quatrefoils. The footbridge is, like the station building, not a North Eastern Railway design. 1856 OS 1:10,560 map. One station (‘Ryhope’) is shown a short distance north of the point where the North Eastern Railway (late Durham & Sunderland) and Londonderry (Seaham & Sunderland) come together and run parallel northwards towards their separate termini in Sunderland. This scale does not permit any detail of the station’s layout to be shown and whether there were effectively two separate stations serving the NER and Londonderry Railway here. In 1858 the Londonderry Railway opened a station, on the more southerly site of Ryhope East, so the survey of this map must pre-date its opening. 1897 OS 1: 2,500 map. The first station site (see LR and 1st NER station pages) is no longer named and two separate Ryhope stations are drawn in detail. A building adjacent to the site of the original NER station is marked with a gated track approaching it from the south. The new Ryhope (Londonderry Railway) station is drawn in detail. The west (down) platform has the main building close to the footbridge, and the coal depot and some sidings are shown to the north. On the east platform the waiting shed is shown and the signal box is on the same side of the tracks, north of the footbridge. The station is not given a name, but it was not yet known as Ryhope ‘East’. 1920 OS 1: 2,500 map. The station is now identified as ‘Ryhope East’; the suffix was in use by December 1903. In 1900 the North Eastern Railway took over the Londonderry Railway to incorporate it into the direct route between the Hartlepools and Sunderland which opened in 1905. 1953 OS 1:2,500 map. The southern section of the main building is now identified as ‘Railway Cottage’. Both platforms are named. Behind the west (down) platform two buildings are numbered 2 and 3 East Station Cottages. A gravel pit has been excavated immediately east of the station. Looking south at Ryhope East, probably in the early years of the twentieth century. The station building is to the right and a waiting shed is seen on the up (southbound) platform. The down platform at Ryhope East, looking north-west. The station building possesses two storeys, but only the upper one presents to the platform. It is a distinctive and appealing design in uncoursed stone, notable for its decorative bargeboards and the roof carried forward on columns to provide shelter. The photo was probably taken between 1911 and the late 1920s as suggested by the livery and lettering on the van, the OXO advertisement and the uniforms of the staff. The northern end of Ryhope East station in August 1958, looking north along the down platform. 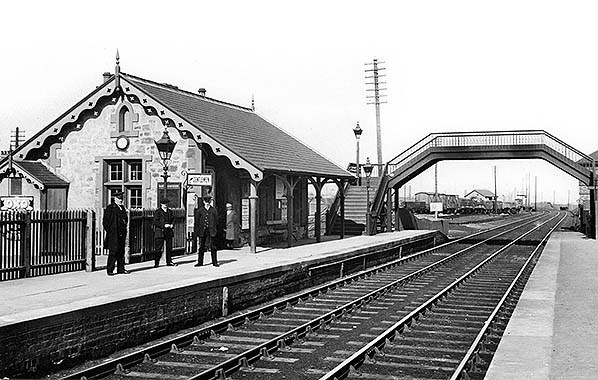 The station would close to passengers in March 1960. The main building, left, is notable for the elaborate bargeboard and the roof carried forward on pillars to provide shelter. The waiting shelter, like the main building and the footbridge was inherited from the Londonderry Railway. The running-in nameboard is a standard LNER design. Traditional gas casement lanterns are seen on the platform, but on the footbridge ‘Sugg’ gas lamps have replaced them. 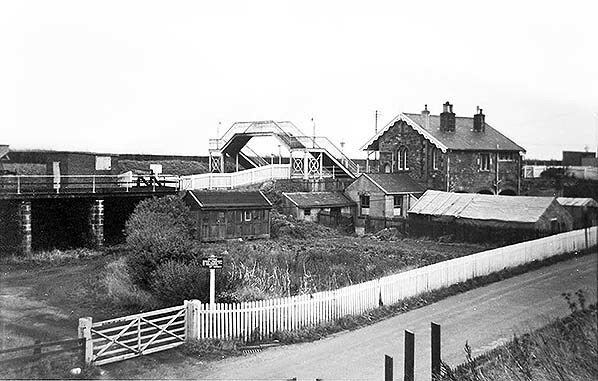 Looking south-east at Ryhope East station in 1961, the year after it closed to passengers. Very little has changed since the earlier (undated) photograph from a similar viewpoint. Looking north at the site of Ryhope station in 2013. 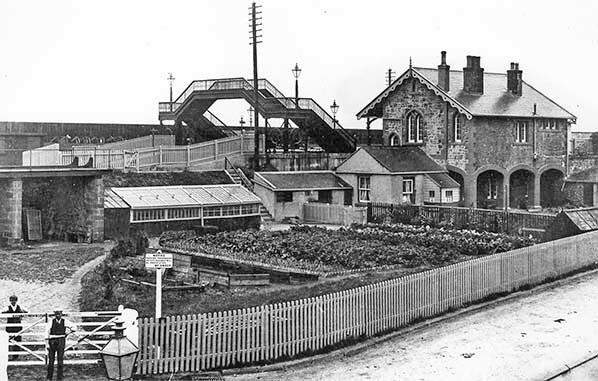 The station was demolished by 1972 and a new road, Sea View, impinges upon the site.